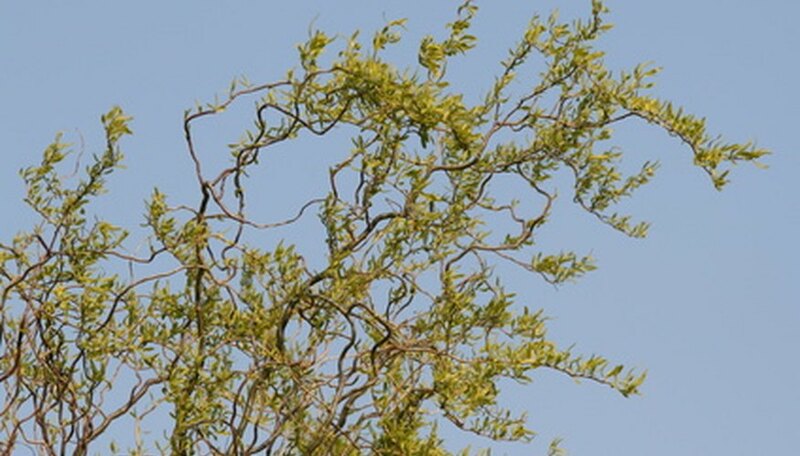 The corkscrew willow tree (Salix matsudana) is a small to medium-sized tree that grows up to only 30 feet tall with a 15-foot-wide canopy spread. Corkscrew willows are ornamental trees with twisted branches that grow upright from the trunk, then curve back to grow horizontally. This willow tree grows rapidly, gaining up to 15 feet in height each year, but unfortunately this fast growth also makes it a short-lived and weak tree. Corkscrew willows are prone to breakage due to their weak wood and are highly susceptible to pests and diseases. Water your corkscrew willow tree deeply and thoroughly once each week during the spring, summer and autumn to soak the soil around the entire root area. Water the tree only in the absence of rainfall. Feed your corkscrew willow once each year in early spring with an all-purpose tree fertilizer or a slow-release 10-10-10 NPK formula. Spread the fertilizer granules on the ground over the entire root zone of the tree and water thoroughly. Pinch back the top shoots that are growing upward to promote lateral branch growth and a bushier form. Prune away all broken, damaged or diseased branches in late winter or early spring while the corkscrew willow tree is dormant. Treat your corkscrew willow for infestations of insects like aphids, gypsy moths, willow beetles, lace bugs and poplar or willow borers. Corkscrew willows are highly susceptible to pests, so treat the trees with an appropriate insecticide recommended by your local agricultural extension office. When selecting a planting location for the corkscrew willow tree, keep in mind that it's a short-lived tree with aggressive roots and potentially destructive surface roots. Plant the corkscrew willow in a moist location and away from underground utilities, sidewalks, driveways, patios or septic systems for best results. Beware of diseases like crown gall, willow scab, black canker and other various fungal or foliar diseases infecting your corkscrew willow tree. Prune away all infected branches, rake up and discard any diseased fallen leaves, and apply an appropriate fungicide to the tree according to the directions on the label.